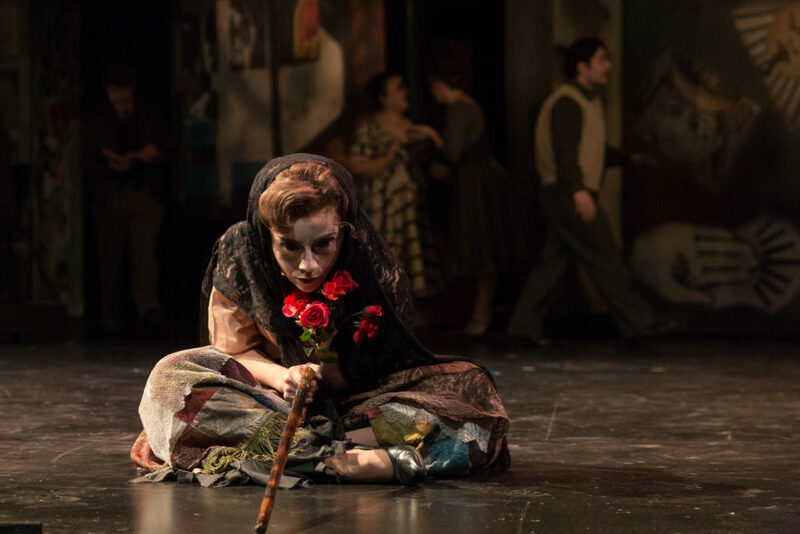 Mezzo-soprano Audrey Babcock is Maria in San Diego Opera’s MARIA DE BUENOS AIRES, January 2018. Photo by Karli Cadel. “Yo soy Maria de Buenos Aires / de Buenos Aires Maria ¿no ven quién soy yo? 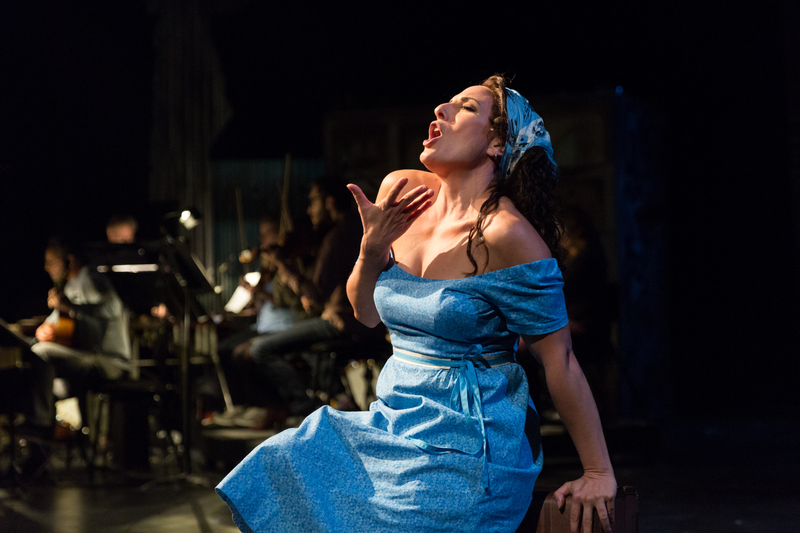 “I am Maria de Buenos Aires … Do you not see who I am? San Diego Opera’s 2017-18 dētour Series production began Friday, January 26, and was slated for three more performances in the home of the San Diego Repertory Company, the Lyceum Theatre in Horton Plaza. The venue is a fine one and the whole show seemed highly polished on its opening. Baritone Paul La Rosa is El Payador in San Diego Opera’s MARIA DE BUENOS AIRES, January 2018. Photo by Karli Cadel. John de los Santos’s staging was strikingly imaginative and included many visualizations of things absent in the published libretto. In fact, Santos provided a dramatic impetus missing in the texts themselves. 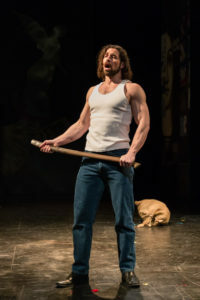 It would be difficult to improve upon the three principals — the eponymous Maria (sultry mezzo soprano Audrey Babcock), El Payador (warm toned “barihunk” Paul La Rosa), and El Duende (charismatic and protean actor/narrator Celeste Lanuza). Two male dancers, Laurence and Lester Gonzales, were elegant and exciting to watch in their tango duet. Seated at the piano, conductor Bruce Stasyna deftly commanded a skilled ensemble of 11 players, with David Alsina playing the all-important bandoneon, an instrument that embodies Maria, the spirit of the tango and possibly Argentina itself — or so we are led to believe. So much surrounding the work of Astor Piazzolla has been hyped into a mythos that exudes “otherness” and challenges the naive outside world to fully comprehend it. The bandoneon has a mystical power, like the masks in Japanese Nōh drama. Yet there is no denying the frontal seductive appeal of Piazzolla’s music. Although his maniupulation of traditional musical forms is ingenious and sophisticated, he communicates directly to the listener. His score ignites both passion and contemplation. Encountering Maria for the first time involves so much arcana! The Performances magazine program tries to enlighten us. 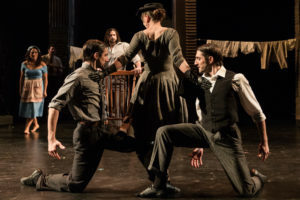 A payador is “a sort of gaucho minstrel,” Canyengue is a style of tango that “connotes roughness, sensuality and even rebelliousness,” a duende is a kind of goblin or sprite (good or bad) out of folklore, Lunfardo is a low-class dialect — and so on. We also need to be aware that the psychoanalysts that crop up in Scene 12 are explained by “the extraordinary density” of same in Buenos Aires. And, of course, we’d better go to Wikipedia to find out all we can about the Tango Nuevo. Lots to learn to get though the next hour and a half! 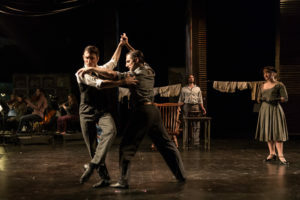 Dancers Lester and Laurence Gonzalez in San Diego Opera’s MARIA DE BUENOS AIRES, January 2018. Photo by Karli Cadel. Actor Celeste Lanuza is El Duende in San Diego Opera’s MARIA DE BUENOS AIRES, January 2018. Photo by Karli Cadel. This tango operita also defeats the likely expectations of one not already familiar with the work. There is not as much actual tango dancing as one might hope for, and it often seems as if spoken narration exceeds the amount of singing. It really goes without saying, the piece is not an opera but something virtually sui generis. The best classic operas have characters who sing and reveal their emotional states. Ferrer’s characters, such as they are, are abstractions that resist our attempt to relate to them. Fortunately, all three featured performers were able to bring an exciting immediacy and specificity to their roles, no matter how obscure the meaning or vague the action. Babcock’s Maria became a real woman, a mesmerizing vocal and physical presence. La Rosa, both her lover and her guardian angel, simply commanded the stage with macho authority and suave vocal artistry. (Their voices did not appear to have been amplified.) As the mysterious narrator, Celeste Lanuza shifted shapes, playing a range of characters, from a clown to tispsy prelate. Her El Duende was both comical and demonic. Everybody else in this episodic show was billed merely as “Ensemble,” but these performers provided a dazzling panoply of colorful Argentine types. What’s it all about? Ferrer deals chiefly with a traditional literary idea of death and resurrection. A nation’s culture and art are bound together on this circular journey. Maria is murdered halfway through the piece and emerges as her own Shadow. At the end she gives birth to something. A new Maria? We are definitely in Joseph Campbell territory! Not to mention the works of Carl Jung, Sigmund Freud, or Sir James Frazer in The Golden Bough. Maria might inspire erudite college lectures on the sacred and the profane, and the Apollonian and Dionysian, the Shadow and the Self — but perhaps it’s best to succumb to Piazzolla’s charms without dwelling too much on such conundrums. Maria = Tango = Buenos Aires. That’s enough. I have tried to credit almost everyone below. 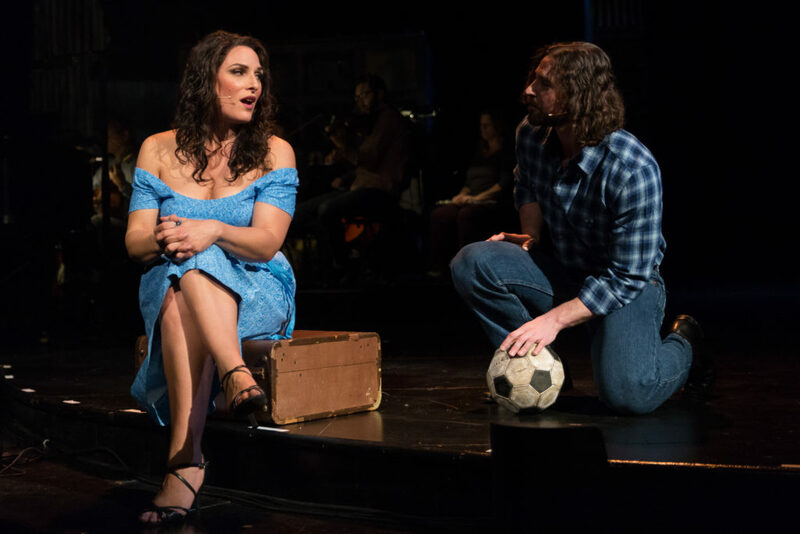 Mezzo-soprano Audrey Babcock (Maria) and baritone Paul La Rosa (El Payador) in San Diego Opera’s MARIA DE BUENOS AIRES, January 2018. Photo by Karli Cadel. (L-R) Dancer Laurence Gonzalez, mezzo-soprano Laura Bueno (ensemble), and dancer Lester Gonzalez in San Diego MARIA DE BUENOS AIRES, January 2018. Photo by Karli Cadel.